When it comes to the polemical slogan tee, nobody does it better than Katharine Hamnett. The London-based designer, who’s been doling out wearable catchphrases like “Choose Life,” “No War,” and “Use a Condom” since 1983, is teaming up with online retailer Yooxygen to hawk another well-timed statement: “Save the Sea,” a 14-piece collection of ecologically minded one-piece swimsuits, bikinis, trunks, coverups, and beach totes. Made from sustainable fabrics such as organic cotton, organic silk, and recycled polyester, the ethical beach collection harkens to the golden age of glamour. The 1950s-inspired silhouettes, decked in polka dots, stripes, and ruffles, will draw out your inner retro-bombshell in no time. “The sea that we all love is dying due to the impact of human activities,” says Hamnett of her collection. Another reason to vote with your dollars: A percentage of the retail price of the collection goes to help West African farmers through Hamnett’s “Fashioning a Better Future” project, which is run by the Organic Exchange. When it comes to the polemical slogan tee, nobody does it better than Katharine Hamnett. 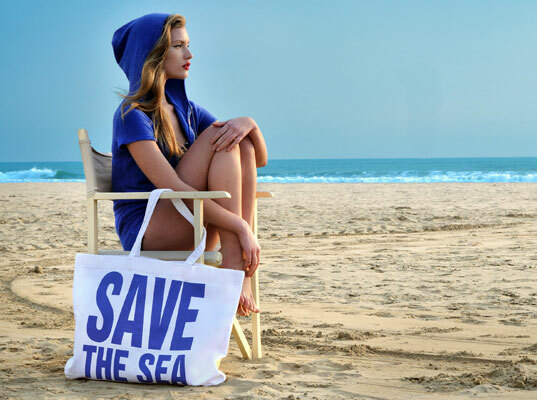 The London-based designer, who's been doling out wearable catchphrases like "Choose Life," "No War," and "Use a Condom" since 1983, is teaming up with online retailer Yooxygen to hawk another well-timed statement: "Save the Sea," a 14-piece collection of ecologically minded one-piece swimsuits, bikinis, trunks, coverups, and beach totes.